French Emblems: Emblem: Ius & Philosophia. Exposcit, vicium siluit quod venditor illi. Significare malum expressè, qui conscius esset? Praecipiunt, ius sed linguam factumque recensent [=recenset] . Fraus dirimit, certis lites claudantur ut annis. Et tractat sese multò res inferiores. Sergius [Aurata] had sold a house bound up with a defect, subject to servitude. * When Gratidianus had decided to sell it again, he said nothing to that same man of the servitude, a thing that the former owner had known about, and the price would reflect the burden. But the purchaser Aurata goes to court on a charge of fraud and demands that the case be heard before a judge, because the seller concealed the defect from him. But what need was there to point out the defect expressly to the man who had been the owner and subsequently the vendor, seeing that he knew about it? Accordingly those who profess wisdom and the fundamentals of rectitude here look at motives and intentions and urge honest conduct even between friends; the law considers words and actions. Law bases itself on externals, nor does the bit of dishonesty so circumscribe the gain that the lawsuits are brought to a close in a certain number of years.† The wise man therefore is one who understands high matters and self-consistent ones, not the obvious. So the prudent man makes a different judgment in his activities and deals with things that lie far below him. * A servitude is a liability resting on a property by which an owner is bound to give certain facilities to a neighbour, e.g. right of way. † The sense of this sentence is unclear. 1. 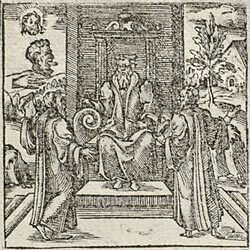 Aonio Paleario (Antonius Palearius): Professor of Greek and Latin at Siena and Milan. Wrote against practices of submitting Scripture to Church tradition (for example, purgatory). He was arrested and conducted to Rome for opposing the Inquisition, and in consequence was executed in 1570 (some sources say he was burned in 1566). 2. This is based on Cicero, De officiis 3.67-68. Sergius Aurata sold a house subject to a servitude to Marius Gratidianus. Gratidianus subsequently sold it back to Aurata who took him to court for not mentioning the servitude. A legal dispute followed. Cicero says that the law and the philosophers approach sharp practice differently.